Have trouble speaking a clear, Major Gift Ask? Are you working harder and harder — without the Major Gift Results you want? volunteers, and program folks to get involved in fundraising? Location: Next one coming soon! Make a change and sign up today for a MORE Major Gifts Workshop. Invest in your growth and success at this 3-day, small-group, CFRE approved, experience like no other! Your success depends upon BOTH your methods and your mindset! Major gifts development professionals are quite often their own worst enemy. With more than 30 years of firsthand major gift fundraising and management experience, Marcy Heim personally knows the self-limiting beliefs and self-defeating mindsets that hold fundraisers back. …to give other fundraisers like you new insights into how to embrace and manage your work so you can have both more giving success and more joy in your life. Now as an international speaker, author, and development coach, Marcy reveals her most powerful secrets to breaking self-destructive beliefs and teaches major gift development methods that actually work LONG TERM…Again and again. Have fun… sing…. And find JOY in this honorable and noble profession. Examine the powerful role your mindset plays in your overall development success and learn words and techniques that will increase your overall satisfaction in your development work! The MORE Major Gifts Workshop has been reviewed and pre-approved by CFRE International for continuing education points on applications for certification or re-certification educational requirements. Marcy Heim is a CFRE International Approved Continuing Education Provider. Full participation in the MORE Major Gifts Workshop is applicable for up to 11 continuing education points in Category 1.B – Education of the CFRE International application for initial certification and/or re-certification. Now, let’s talk about one of the top concerns: BUDGET. The secrets to breaking through the barriers between you and your success? The ability to raise a major gift….period. Private training like this—with CFRE accreditation—can cost you anywhere from $800 to $2,500. But if you register today, you can bust through the barriers keeping you from your next major gift. Does walking away from a 2-day intensive with an execution-ready Relationship Action Plan and confidence to ASK WITH JOY for your next major gift seem hard to believe? THEN LISTEN TO WHAT ARE PAST ATTENDEES HAVE TO SAY! The materials presented give an overall perspective combined with Marcy’s real-world plans. With the right planning, capable donors are probably more capable. Marcy is a great workshop leader. David Kail, Catholic Charities of Denver. Watch Denise Lamphier from Grinnell Regional Medical Center share her praise! How do you know if this the right workshop for you? What can you expect to take home with you after The MORE Major Gifts Workshop? 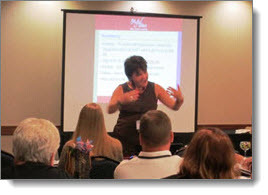 What will you learn in The MORE Major Gifts Workshop? Click below to save your spot during the following MORE Major Gifts Workshops! SPACE is LIMITED AND CLASSES FILL UP. Private training like this—with CFRE accreditation—can cost you anywhere from $800 to $1,500. How to find major donors within your donor database. And—as former attendees tell us—with only one major gift from what they learned, the workshop pays for itself. Marcy Heim, CSP, CFRE, PLCC, and Founder of The Artful Asker, is an international speaker, major giving expert, certified life coach and author to fundraising leadership, staff and key volunteers who are transforming the world by encouraging philanthropy for their missions. She’s also a singer and mom. Marcy’s teaching reflects over 20 years of firsthand major gift fundraising and management experience at the University of Wisconsin Foundation where she and her team raised millions of dollars by creating the genuine relationships she promotes in her presentations. She led her unit through three successful comprehensive campaigns including the $1.8 billion Create the Future Campaign. 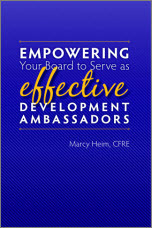 Her first book, “Empowering Your Board to Serve as Effective Development Ambassadors” is a popular board and staff training guide for major gift success. Marcy was presented the CASE Crystal Apple Award, is a recipient of the FP Outstanding Fundraising Professional Award. She is a graduate of the Master Teachers Academy and a certified CFRE instructor. She’s regularly featured at AFP, AHP and CASE Conferences throughout the US and Canada and holds a UW-Madison Natural Sciences degree. Her audiences include higher education institutions and hospitals throughout the US and Canada, conferences of all types and a vast array of non-profit and for-profit organizations. Through her coaching programs, her workshops and training sessions she coaches Staff, Deans, Executive Directors, University Presidents and volunteers through the key steps of creating and managing long-term transformational major gift donor relationships. Jen Davie is a fundraiser, business owner, runner and mom. She has over 10 years of development and fundraising experience in the non-profit community working with budgets ranging from $550,000 to $5,000,000. She is the owner of Jen Davie Consulting, LLC, a consulting firm specializing in building the foundation of development offices. This includes annual fund, grants, monthly giving, database management and special events components. Jen has created success in fundraising through implementing processes and strategic planning throughout organizations. Most recently, moving a local nonprofit from a $500,000 annual budget to a $750,000 annual budget and raising $2.6M for a comprehensive capital campaign. Strategically aligning the marketing, donor stewardship, and planning was essential in this growth. Jen led the fundraising department from no database and the largest individual gift at $5,000 to over 6,000 individuals and annual individual gifts of $50,000. Jen is a Certified Fund Raising Executive (2014), and most recently became an AFP Master Trainer (2018). 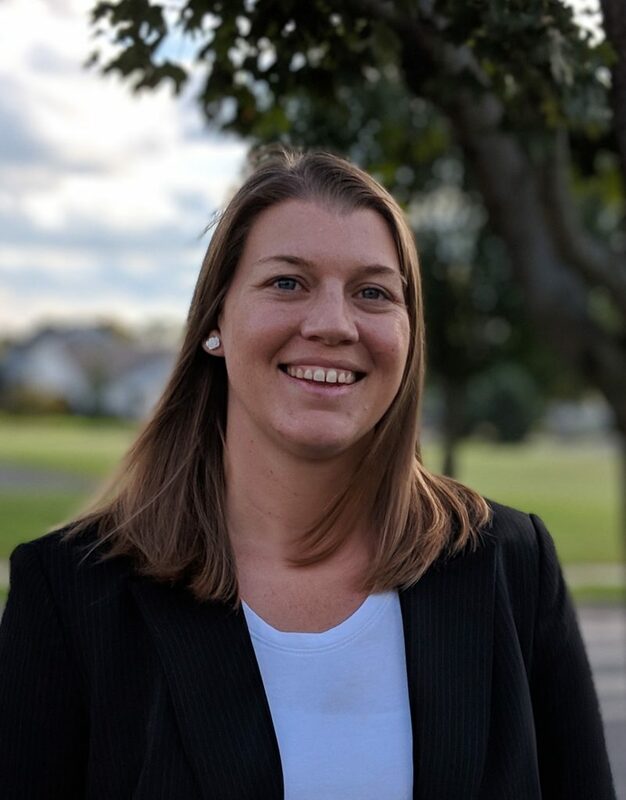 Jen currently serves as President for Greater Madison Association of Fundraising Professionals, Vice-President for University of Wisconsin-Platteville College of BILSA Alumni Chapter, and member of the University of Wisconsin-Platteville Alumni Association Board of Directors. Jen’s strength is in creating and building processes that will allow for long-term growth and success in fundraising. If we can change the way we approach the infrastructure, we will have room to manage what we create.